Copyright Holder: Original map data provided by The Atlas of Canada (4th Ed, p.79-80). Produced under licence from Her Majesty the Queen in Right of Canada, with permission of Natural Resources Canada. This map shows locations of fur trading posts for the period 1600 to 1870. The first known owner of the post (France, England, Canadian independent, XY Company, North West Company or Hudson's Bay Company) and the known length of operation are noted on the map. Two supplementary texts accompany the map with background information on post owners as well as a condensed history of the Canadian fur trade. The development of the fur trade can be divided into six main time periods, different from each other in regard to both type and to region of operation. Zoom in on Image 2 to read the details. (c) Text courtesy of Natural Resources Canada. Read more about trading posts - enter 'posts,' 'forts,' or 'commerce' in the search box to your left. Check the Beaver Index - e.g., 'trading posts,' 'forts,' 'business' etc. 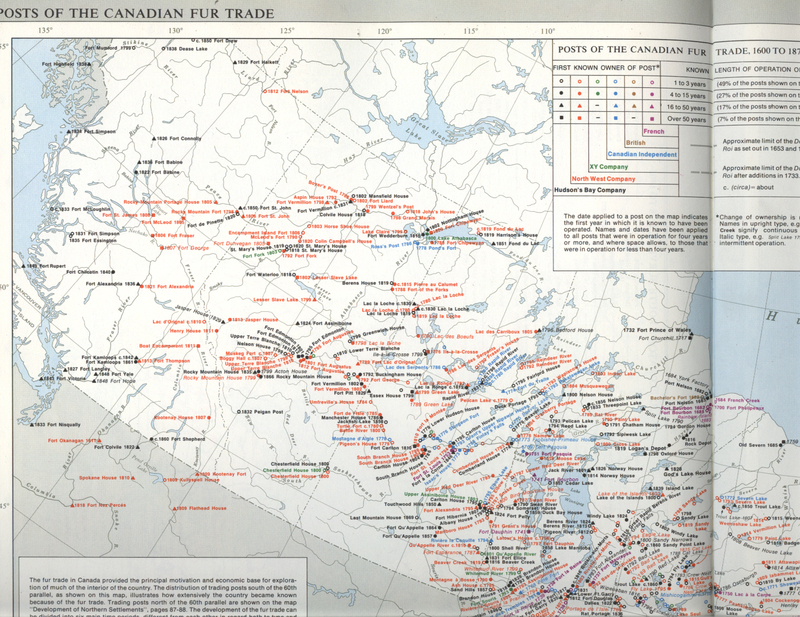 Visit the Atlas of Canada online to see this map in its entirety with zoom in/out features. In 1869, Rupert's Land, the area which the Hudson's Bay Company controlled, was sold to Canada for 300,000 pounds and the rights to one-twentieth of the land in arable areas. The fur trade continued as settlement increased, and many of the old trading posts became retail stores.